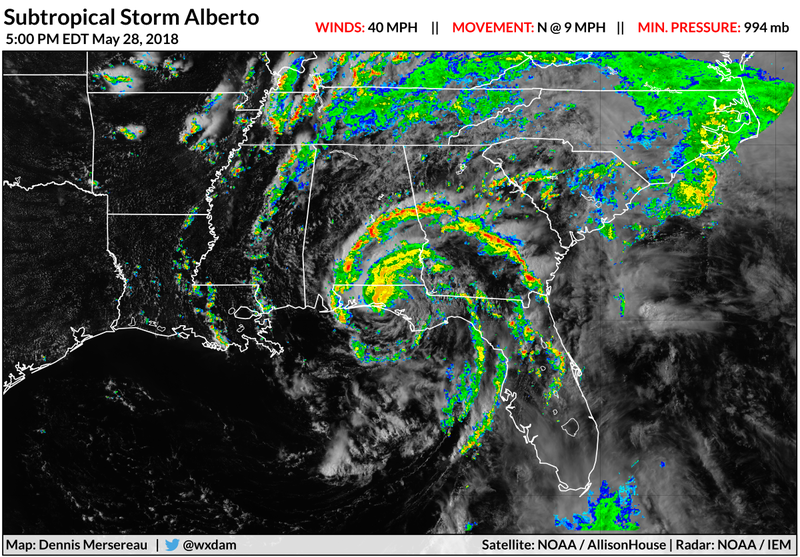 Subtropical Storm Alberto made landfall near Laguna Beach, Florida, around 5:00 PM on Monday, with maximum sustained winds of 45 MPH. Laguna Beach is about halfway between Fort Walton Beach and Panama City. The storm will continue to produce heavy rain, gusty winds, and the chance for isolated tornadoes as it pushes inland and moves toward the Great Lakes over the next couple of days. 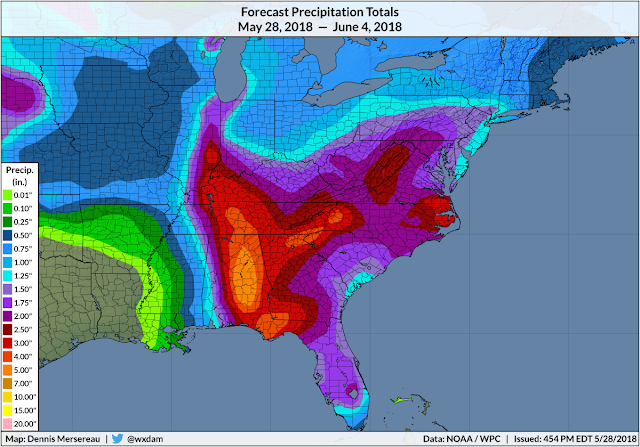 An additional two to three inches of rain are possible across the Mid-Atlantic and Southeast as Alberto and its remnants move north toward the Great Lakes through Thursday. The heaviest rain will follow the core near the center of the storm as it tracks north through Alabama and Tennessee. There's an elevated risk for flash flooding across areas expecting the heaviest precipitation totals—the greatest risk for flash flooding beyond today will exist in the Appalachian Mountains of Georgia and the Carolinas on Tuesday. There's also a risk for isolated tornadoes in the southeast on the eastern half of the system. Some of the stronger discrete thunderstorms that develop will have the opportunity to produce small, quick tornadoes. Small tornadoes are dangerous nonetheless, and the quick nature of tropical tornadoes can reduce warning lead time to just a few minutes. The forecasts for Alberto were decent considering the nature of the storm. Alberto did max-out with winds of 65 MPH on Sunday evening before weakening before landfall. The landfall point has been within the cone of uncertainty since Friday morning. Several inches of rain have fallen across the southeast over the past few days and the rain is continuing north as it comes ashore. Alberto never made the expected transition from subtropical to tropical. A subtropical storm is a cyclone that has both tropical and extratropical characteristics, a sort of hybrid between the two. Subtropical storms derive some of their energy from upper-level winds rather than thunderstorms around the center of circulation. The storm's maximum winds were also displaced from the center for most of its life. The storm also wasn't totally warm from top to bottom, a requirement of tropical systems. The storm remained an organized mess for its entire life, more closely resembling a nor'easter than a tropical storm. The above satellite image shows Alberto's interesting appearance late on Sunday night. It's not clear whether or not that technical designation confused people in the path of the storm's rain and wind—meteorologists and weather reporters did a pretty good job explaining "subtropical" and hammering away at the risks rather than the name. Unfortunately, social media is packed this weekend with photos and videos of people ignoring the red flags and beach patrol warning people to stay out of the water. Drowning from flooding is the number one cause of death in tropical cyclones, but people routinely drown in rip currents even when storms are hundreds of miles offshore. They just don't listen to the warnings. They think they know better and they think it won't happen to them. There's not much we can do to get people to heed the warnings other than constant education and pounding away the message that it's too dangerous to swim in the ocean. I wrote for Forbes a few years ago that meteorologists can't help people who don't want to be warned. I wrote the post in the context of people driving through flooded roads despite signs, warnings, and common sense, but it could just as easily apply to rip currents. June 1 marks the beginning of hurricane season in the Atlantic Ocean. Storms commonly form closer to land during the early part of the season and start forming farther out in the Atlantic as the summer wears on. The historical peak of hurricane season's activity is the second week of September.